ViewCast Corporation are a US company based in Dallas, Texas and are best known for the Osprey range of streaming media products. The company produces a wide variety of encoders and decoders for Windows Media, Real Video & MPEG applications. ViewCast Osprey Video has been a major player in the pioneering efforts of the streaming media industry since its inception in 1997 with Progressive Networks (Now RealNetworks). Osprey Video has maintained its position as an industry leading developer and manufacturer of cutting-edge streaming media capture, encoding and CODEC technology. The streaming media workhorse that launched Internet video! Don't be fooled by the low price of this card either; industry leaders Microsoft and RealNetworks back it because it is the most widely used video capture card on the planet. 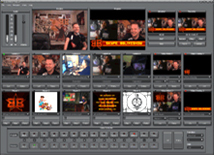 Ideal for use with VIDBlaster - a software video switcher (vision mixer) ideal for web broadcasting & streaming. The next step up from the Osprey 100 combining audio and video capture into a single device. There are two Osprey 400 models to choose from: the Osprey 440 and the Osprey 460e. Both models offer 4 separate inputs that can be captured in real time, or used for live multi-camera production with software like VIDBlaster. The Osprey 460e card fits in a single channel PCI-Ex 1x slot, whereas the 440 is designed for traditional 32 & 64bit PCI slots.